Maria is the Spa Director, licensed Esthetician for 25 years, and a local resident of the Foothills community. As the founder of Uptown Face and Body Care in 1996, she envisioned opening an integrative skin and body clinic which encompasses her dermatology skin care experience, along with day spa modalities. Having worked in medical dermatology practices for many years, she brings an advanced level of care for her clients in the treatment of mild to severe acne, and mature skin. She performs a variety of facials to meet the individual needs of her clients, from relaxing European facials, to skin renewal treatments, post-laser and rosacea care. "I find it important to provide a calm and caring experience for my clients, while giving them noticable results". She maintains a working relationship with dermatologists in order to provide an integrative standard of practice. The team of gifted, well-trained Massage Therapists and cosmetic staff shares this philosophy of personalized and corrective care. The goal of our staff is to bring about tangible relief, and visible results. We develop wonderful working relationships, and we partner with them in reaching their skin and body goals. We are highly rated because customer service is our top priority. We appreciate our clients, communicate with them, and make them feel special! Uptown Face & Body Care is located in the "Montrose Shopping Park", Village Square - Established in 1996. ﻿Our Mission: Enjoy the Boutique Experience! 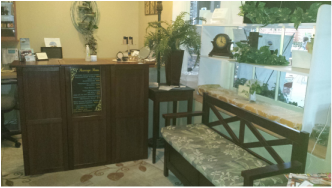 As you enter our Day Spa, you will feel a sense of calm, and a caring professional will assist you. As therapists, we feel privileged to meet the specific skin and body care ﻿﻿﻿needs of our clients﻿﻿﻿. Whether it is a skin problem, a muscle issue, or general stress, we listen and provide a calming and caring touch. Our clients always leave happy and pampered. That is the most rewarding aspect of our job! Our seasoned, high-quality Massage and Skin Care staff offers top-notch Day Spa Massage and Facials, serving Montrose, La Canada Flintridge, La Crescenta, Glendale, Pasadena, and the 'Foothills' communities, since 1996. Our Montrose day spa is tastefully appointed to encourage deep relaxation, while clients receive high quality facials and massage therapy. We are proud of the positive reviews and rankings we have received! Thank you, to all of our loyal clients! Jackie L. - " I have experienced Uptown Face & Body Care twice and am very excited for my third time coming up next month. Both times I have come, I have had a 1-hour massage. I even had a facial with the owner, Maria. Normally, some therapists tend to perform better than others. At Uptown Face & Body Care that is not the case. Each therapist has the ability to relax you, while at the same time targeting problem areas." Pamela P. - ..I am a serial massage patron and have had massages at various places and of various types (low end strip mall chains, high end fancy resort, Thai, Chinese, body work ...). This massage ranks high on my list of favorite massages. Sean - "I always feel better after a session than before. Now when I work instead of my back hurting most of the time, it hardly hurts at all and I'm able to stand up straighter, and my shoulders can relax." Michelle W - I live in the area, walk by often, but never had stepped foot in this business. I had a fantastic experience!